We live at a church camp way up in the mountains of south central Montana. 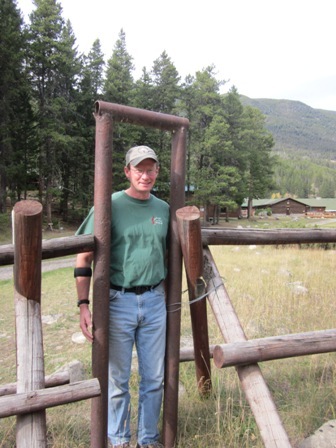 Like most of the ranches in our area, we have a log rail fence to define the property. 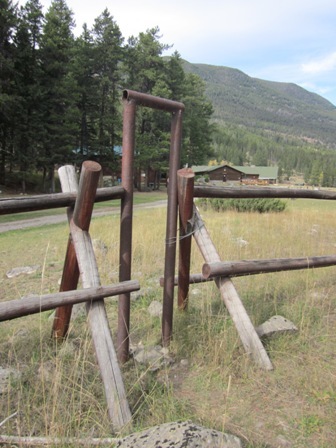 At one point in the fence, a small walk-way was installed so hikers can pass through without climbing over. This is handy if you are the right size. I found when we had little kids that I didn’t fit if I had the back-carrier or stroller or wagon. We could only fit through the narrow gate one at a time. This narrow gate is such a symbol of God’s Word above. Most people would rather go through the main entrance because they can do it their own way, bringing the big vehicle, the family, the horse trailer, the RV…all their extra stuff. But God says, “Enter by the narrow gate.” We can’t bring our stuff or anyone else to heaven, only ourselves. We can’t even do good works or give big offerings to enter heaven. All we can do is believe in Jesus and point others to the narrow gate. We can tell our family and friends that Jesus is “the way, the truth, and the life. No one comes to the Father except through” Him. John 14:6 (NKJV) We can explain “for God so loved the world that He gave His only begotten Son, that whoever believes in Him should not perish but have everlasting life.” John 3:16 (NKJV). And we can urge them to “believe on the Lord Jesus Christ, and you will be saved.” Acts 16:31 (NKJV). Looking at my photo of the narrow gate, you might suggest that a person could just climb over or through, or crawl under the log rails. That might just work to get to camp, but God does not allow that for getting to heaven. We don’t want to be thieves and robbers. We want to enter the way God intended, through the narrow gate. How hard can that be? Jesus says, “And again I say to you, it is easier for a camel to go through the eye of a needle than for a rich man to enter the kingdom of God.” Matthew 19:24 (NKJV) A camel wouldn’t even fit through our narrow camp gate, let alone the eye of a needle. How then is it possible that we can enter the kingdom of God? Jesus responds, “With men this is impossible, but with God all things are possible.” Matthew 19:26 (NKJV) I pray this possible miracle for all my family and friends and even my enemies, that they will believe in Jesus, my Savior, the Narrow Gate, the only Way to heaven. This entry was posted in Short Essays on Faith and tagged christian prayer, My Tea Cupp Prayers, narrow gate, prayer, Tea Cup Prayers by Jennifer Grace. Bookmark the permalink.